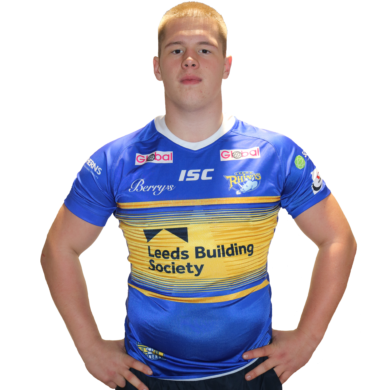 Prop Tom Holroyd was awarded the number 32 shirt ahead of the 2019 after an impressive season with the Academy, that saw him called up to make his first team debut against Catalans Dragons. He returned to the Academy coming off the bench in their semi-final and in the Grand Final. Tom was part of the 13 players that joined the Academy in 2017 with five of his Siddal team mates and has grasped his opportunity with the club. At Siddal he won the National and Yorkshire Cup in four different age groups. In 2018 He was also called up for the Yorkshire Academy and England Academy that historically beat Australia Schoolboys on home turf. He has represented England at Under-16 and Under-18 level. If he wasn’t playing rugby, his ideal occupation would be a model but he would be a darts player should he change sport. His favourite sportsman is boxer Mike Tyson and would buy a farm should he win the lottery. If he could go on a road trip if would take his team mates Harvey Spence, Will Scrimshaw and Harry Georgiou.